August 31, 2010  Eggs have been getting a bad rap lately as the number of people being made sick by eggs contaminated with salmonella continues to rise. 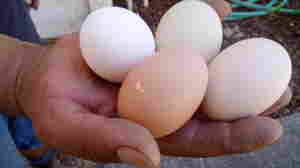 But eggs themselves -- if they come from a healthy bird -- are remarkably resistant to contamination. 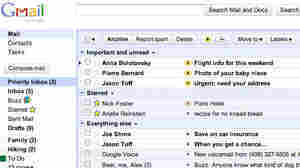 August 31, 2010  The company says the feature will help set priorities for a user's inbox and ease up that sense of information overload. Google says people who used the new system in its testing phase saved about a week's worth of time over the course of a year. August 31, 2010  New York Attorney General Andrew Cuomo is probing credit cards being pushed by health care providers, including vets. After a teaser rate expires, the interest charges balloon and leave consumers with unexpectedly big bills. August 31, 2010  Cars with higher fuel economy and very low tailpipe emissions would get an A, while less-efficient cars could get a D. But critics say the proposal doesn't address all of the complex reasons people buy cars. August 31, 2010  A gelato company in Washington, D.C., is a model of a big trend in the food industry: going artisan. Plenty of people seem willing to pay the higher prices of vendors that use locally sourced products and make smaller batches. A dairy in Pennsylvania is Pitango Gelato's source for the high quality ingredients and natural flavors it sought. August 31, 2010  Publisher Conde Nast plans to produce "special editions" of Gourmet magazine. Three upcoming issues will use recipes from previous issues. The first one is Gourmet Quick Kitchen which hits newstands next Tuesday. August 31, 2010  Aggressive incentives that have lured drivers into dealerships, even during the recession, are starting to disappear. That's the assessment from Edmunds.com. The auto information site says with automakers newly lean and profitable, they're pulling back on promotions. August 31, 2010  Federal health inspection reports released Monday show numerous violations at the egg factories involved in the massive egg recall this month. There was considerable evidence of rodent infestations and other unsanitary conditions. The Food and Drug Administration said it's unclear whether the level of violations was greater than what might be expected at a large operation like this. August 31, 2010  California lawmakers are scheduled to vote Tuesday on a proposal to phase out and ultimately ban plastic grocery bags statewide. But plastic industry trade groups are lobbying hard and spending thousands to defeat the ban. 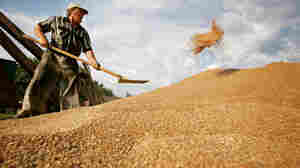 August 31, 2010  Russia's drought and massive wildfires have sent wheat prices through the roof. Fortunately, most U.S. wheat farmers have had a stellar harvest and are likely to help meet global demand. That's especially the case in Colorado, which exports 80 percent of the wheat it produces. 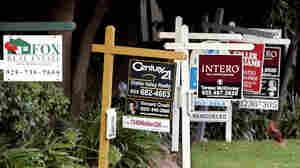 August 30, 2010  Financial crises are followed by 10 years of high unemployment and low home prices, according to a new study. August 30, 2010  Andrew G. Biggs of National Review argues, when it comes to Social Security, it's too politically risky to revive the Bush-era idea of personal accounts. A solution will come from a mix of government intervention and personal initiative. August 30, 2010  As recently as two years ago, mobile banking in the developing world was an object of skepticism among financial insiders. Jamie Zimmerman and Jamie Holmes of Foreign Policy explain why cell phones will do more for the developing world than laptops ever could. August 30, 2010  President Obama was in New Orleans Sunday to mark the fifth anniversary of Hurricane Katrina. The trip focused on the city's struggles and triumphs since the storm and devastating flooding left much of it under water. And the president told residents that help from the government is a long-term commitment.